Walter Darby Bannard. Photo: Kathleen Staples Bannard. How can we demonstrate that Mozart is “better” than Salieri or, for that matter, better than Elton John? Well, we can’t. . . . Mozart thrills me. . . . Elton John does not thrill me. . . . I suppose all we really can have is a Mozart fan club, which will grow or diminish with time. At Princeton, he played the banjo, studied philosophy, and was a member of the most exclusive eating club. He set out to be a scientist, and the love of experiment and discovery stayed with him. However, by the time he graduated in 1956, he knew he wanted only one thing: to be a great painter. Sixty years later, I believe that when he died on October 2, 2016, he knew he had accomplished his goal. But the road was not easy, nor was it without its bumps and detours. Self-taught as an artist, Bannard looked hard at the paintings of William Baziotes and Clyfford Still, whose influence is reflected in his student work. However, Barnett Newman’s 1959 French and Co. show, curated by Clement Greenberg, was the turning point that lead to Bannard’s early stripped-down-to-a-minimum holistic images produced between 1958 and 1965. These works, which now look incredibly prescient, were not immediately recognized for their radicality. They alternate reflective enamel and matte pigments, causing the hard-edged geometric shapes to appear to float on the surface. To get the reflective effect of Chinese lacquer, Bannard applied layer after layer of paint. By now, these single-image paintings with their original pastel palette have entered the canon of Minimalism. Walter Darby Bannard, Cherokee Blanket, 1964, alkyd resin on canvas, 67 x 63". In 1964, Clement Greenberg included Bannard in his landmark Los Angeles County Museum of Art exhibition, “Post Painterly Painting,” and took Bannard under his patriarchal wing. But that protection turned out to be more of a liability than an asset. Bannard was too quirky and independent to be in the inner circle of Greenberg’s initiates. Bannard also stayed in Princeton rather than move to New York, the first of a series of really bad career moves. Greenberg persuaded André Emmerich to show the stained Color Field group, including Helen Frankenthaler, Morris Louis, Kenneth Noland, and Jules Olitski, but he did not officially anoint Bannard. Instead, Bannard showed with John Bernard Myers at the Tibor de Nagy Gallery between 1965 and 1970, when Myers left the gallery. Fortunately for Bannard, Myers’s departure coincided with the return from Europe of Lawrence Rubin, who became his dealer in New York. In the mid-’60s, Bannard abandoned the single image for more complex structures that evoked and contradicted volume but were still explicitly flat. By 1969, he had given up hard-edge geometry in search of something more complex and ambiguous. Always restless and incapable of turning out a branded product, he kept trying out new mixtures, blending fine-art oil-based pigments with commercially produced alkyd-resin house paints. These plastic-based paints were easily mixed with large quantities of white to create brilliant, light-emitting tints and a vastly expanded, nuanced, artificial, unnatural palette. He searched for a new way to present color and structure, incorporating more chance elements until the implied grid finally dissolved, as if falling apart—precisely what happened to art in general in the US during this period of angst and confusion, as all certainty gave way in the wake of assassinations, riots, and the Vietnam War. By the mid-’70s, Bannard gave up referencing an invisible grid and returned to pouring paint. 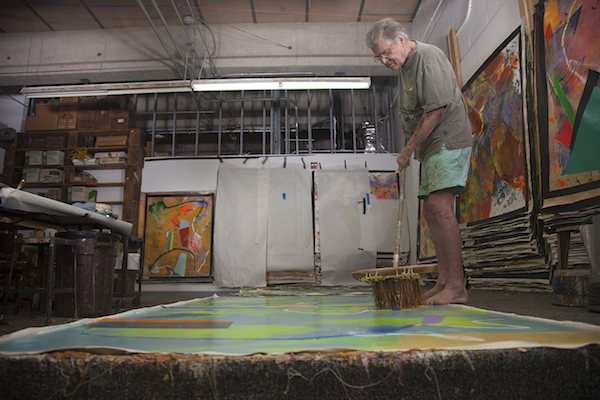 Working on the floor now, he suspended color in a medium thickened by gel to create a raised and tactile surface that emphasized literal flow. His objective was to project radiant color in a form that was not minimal and static but moving and dynamic. During this period, he was also involved with curating an extensive collection of scrimshaw. The delicate engraving relating to whales and whaling on bone or tooth of this distinctly American art focused his attention on detail and drawing as a kind of incision and had a definite impact on his work as he tried to unite drawing with painting. Walter Darby Bannard, Beeline, 1978, acrylic on canvas, 21 x 52". These were difficult goals to achieve, and he spent more than a decade searching for that synthesis. Like Dante, Bannard entered the “dark wood” in which the pathway out was blurred. His friendship with Greenberg continued, but Greenberg was no Virgil, and Bannard had to find the way alone. So he turned his studio into a laboratory for experimenting with a variety of formats, surfaces, textures, techniques, and above all coloristic effects that were unprecedented and often depended on advances in the technology of paint chemistry. For Bannard, the ’70s and early ’80s involved a search for a new way to use color not as field but as a source of light emanating from within, as well as a support for highly textured surfaces. 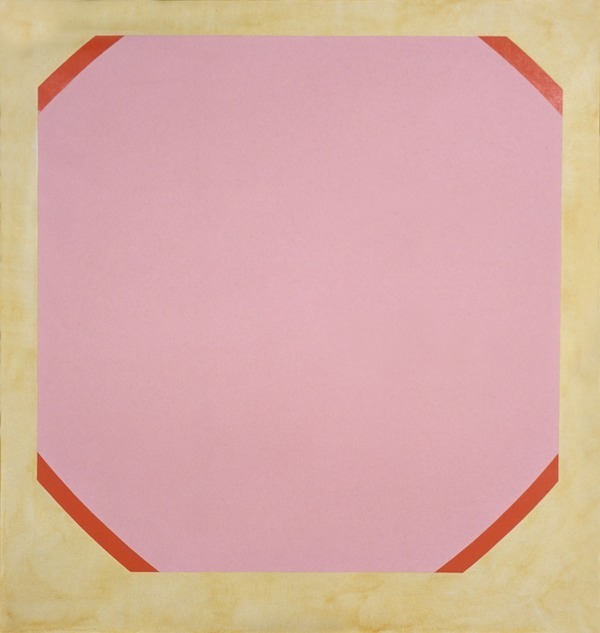 His breakthrough to a new synthesis of color, form, and drawing came at the Emma Lake Workshop in Canada in 1981, an artists’ colony where Newman summered in 1959. Bannard’s supplies were lost in transit, and he had to paint with only acrylic gels and pigments, which made him focus on surface and images emerging from process. The works were virtually monochromatic, and gesture became a focus that contradicted the stasis of his Minimal works. Walter Darby Bannard, Blue Bounce, 1983, acrylic on canvas, 33 x 81 1/2". The results were not entirely resolved until he mastered the properties of new mediums to create the effects he desired. In a review of Bannard’s 1981 Knoedler Gallery show, Vivien Raynor wrote in the New York Times: “Basically, the image consists of lumps of impasto strung together in roughly parallel arcs, as if they were large beads in a necklace. . . . The focus of each canvas is more or less the center where the yellow is strongest, and the impression is of cosmic explosions with bits of matter flying through space.” This image of flux is hardly that of the stable certainty of his early geometric paintings. Bannard found his way out of the “dark wood” in swirling and moving activated gestures and surfaces that stress matter and its application, from transparent to solid color. By the mid-’80s, Bannard returned to pouring colored polymer as well as recording gesture not with the fine-art brush but with cloth, brooms, and mops used to spread paint on surfaces. Here, gesture became not the record of the movement of the hand or arm, but the result of the way paint dries, which gives a sense of both anonymity and surprise. Look, ma, no brushes! In the series of so-called scallop paintings that resemble clamshells where edge piles up paint, he found a way to reconcile painting and drawing, through the process of acrylic paint drying when mixed with malleable gel. In these works, paint is pushed with a template so that pigment piles up at the edges. The raised curved marks that remain once the paint is dried act like drawing, although edge is created by the process of paint drying rather than by the hand depicting line. Now the highly textured surface is integrated into structure. Geometry—although not of any kind Euclid would have recognized—makes a comeback in the form of the curve made by the structuring template. The stylistic twists and turns Bannard took as he went his own way baffled the market. However, the work is not really eclectic: It’s always Bannard, the empirical experimenter. Though his work changes, it is unmistakably his style and approach to structure and color. First he laid on a coat of thin water-based acrylic loaded with pigment, using paint rollers and sometimes his hands. Then a second layer of acrylic gel was applied with squeegees. This layer had so little pigment in the gel that it was virtually transparent, but the swirls of gel became thicker and more opaque toward the curving hard edges of the scallop forms. The thickness and materiality of the wet gel prevented the acrylic from drying, so that it remained pliable (gel takes weeks to dry completely). This permitted Bannard to build up and tear down passages without sacrificing the clarity of color. Using the studio as a laboratory, Bannard developed color charts of dried gel, notating the amount of pigment suspended in it as he mixed concoctions worthy of a mad scientist. This information allowed him to change the final effects by going back into the painting a second time. It’s no accident that the detailed charts resembled the periodic table’s arrangement of the elements, ordered by their atomic numbers, electron configurations, and recurring chemical properties, since he had originally aspired to be a research chemist. In 1987, Greenberg proclaimed Bannard one of the six greatest living painters. It was the kiss of death. By that time the critic had become a parody of his former self, pontificating to the faithful and anathema to a younger generation. Bannard’s refusal to break with Greenberg cost him dearly, in terms of his work as well as his reputation. “There are no second acts in American lives,” that other Princetonian, F. Scott Fitzgerald, wrote. In Bannard’s case, he was wrong. In the “brush and cut” series beginning in the late ’80s, Bannard began thinking of color “as a liquid, flowing over and settling on a roughened surface, changing as it mixed and dried.” In 1989, he moved to Miami. His work was not selling, and he needed the security of a full-time job, as he was not about to join the celebration of vulgarity and nouveau riche social life that New York had become during the reign of Schnabel-style neo-expressionism. His first decade in Miami produced some truly extraordinary paintings that were both daring and confident. He had learned how to express what the old masters have to teach: The eye must travel; it is part of the brain but also part of the body. To reconstitute gesture within a highly structured context required reconciling Jackson Pollock and Willem de Kooning. This was no mean feat. Beginning in 2007, he produced a string of major works, totally resolved and totally original, that brought together detail and variation of line and surface relief in majestic synthesis. He began to use iridescent pigments that caused light to bounce off them. Colors sparkle, gleam, and dance across the surface. Bannard’s work took another significant turn in 2009. He decided that the “brush/cut/fill” technique he had developed was producing forms that started looking organic and figurative. He felt he needed some kind of centering element, and he found it, of all places, in George Herriman’s drawings of Krazy Kat. Bannard began photocopying Herriman’s drawings. “I love the drawing, the weird forms and landscapes, and the eccentric color. It was a kind of surrealism that got to me much more than ‘art’ surrealism ever did,” he remembered. Walter Darby Bannard, Untitled, 2016, acrylic on canvas, 56 x 48". Bannard felt abstract painters had been limited to using familiar colors to denote areas rather than for their pure coloristic effect. Phyllis Tuchman described his palette as being as uniquely personal today as it was fifty years ago. “You can’t even apply a name to his hues,” she wrote in Artforum. In the last decade, Bannard expanded his range to include surprisingly garish tropical, floral colors that were acidic, brilliant, and dazzling. He also began to reintroduce geometric forms that seem to float in an amorphous atmosphere. In the new paintings exhibited this fall in New York at the Berry Campbell Gallery, which sadly became a memorial show, there is an intensity and sense of risk that is impressive and exhilarating. The geometric motifs of his early works now combine flatness and volume in challenging contradictions, which are finally resolved by his ability to synthesize the apparently contradictory through a mastery of technique, form, and new materials. In these ambitious works, the mad scientist as artist, through constant experimentation, had discovered a completely new way of painting, fusing drawing and painting in a truly different kind of space with cosmic overtones reminiscent of the metaphysical works of early Kandinsky and Klee. Bannard was the hipster’s square. He enjoyed the appearance of conformity and pursued a life that looked conventional. But, in truth, he was neither conventional nor a conformist, in either his life or his art. Aware he was not well, he continued to paint with increased vigor, creating large-scale paintings up to thirteen feet wide. 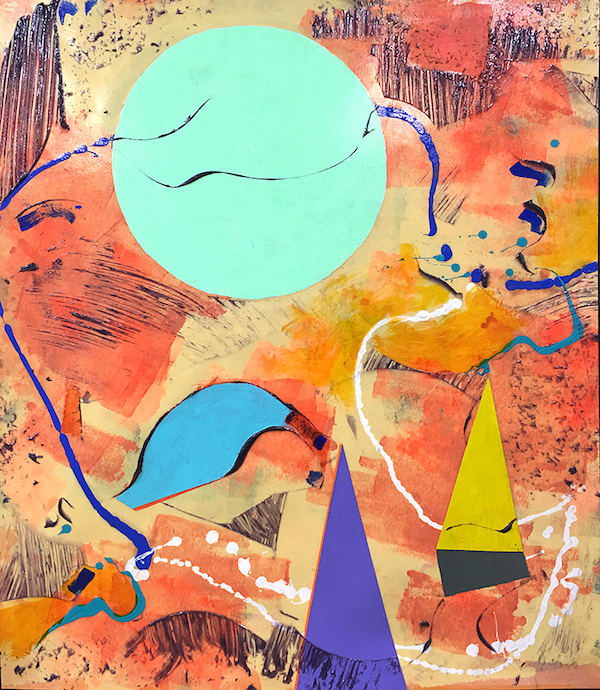 The last time we spoke, he confided, “I’m channeling my inner Miró.” The jaunty triangles and comet trails of dripped paint dancing across the surface do not suggest this is the work of an octogenarian. The Minimalist had begun to embrace the freedom and zany poetry of Surrealist automatism and an atmospheric, extraterrestrial space that give his last works the radiance, spontaneity, immediacy, and freedom he had searched for all his life. Barbara Rose is a critic and curator based in New York and Madrid.